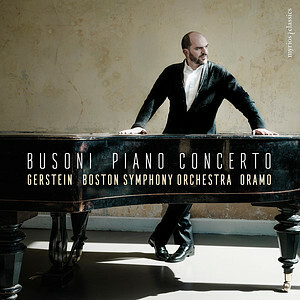 NEW YORK, NEW YORK (February 26, 2019) — Pianist Kirill Gerstein has long championed the music of Ferruccio Busoni (1866–1924), and this spring marks his most ambitious engagement with the composer’s work—a live recording of Busoni’s monumental Piano Concerto with the Boston Symphony Orchestra and men of the Tanglewood Festival Chorus, conducted by Sakari Oramo. The album, whose ties to Boston also extend to Mr. Gerstein and the composer himself, is released by Myrios Classics digitally on Friday, March 1 and on disc in North America on Friday, March 15. Pre-orders are currently available via Amazon. Not only is the album a rare contribution to the discography of this concerto, known principally through only a handful of recordings, but it is the first recording of the work with an American orchestra since Garrick Ohlsson’s landmark recording with the Cleveland Orchestra 30 years ago. The new album also offers insight into Busoni and his music through the inclusion of a deluxe, 88-page booklet containing rarely published photographs and documents from the Busoni archive at the Staatsbibliothek Berlin, as well as specially commissioned essays by leading Busoni scholars Albrecht Riethmüller and Larry Sitsky. Due to its immense difficulty and scale, Busoni’s Piano Concerto is rarely performed, and this live recording captures the first performance of the work in the BSO's 137-year history. Composed between 1902 and 1904, this five-movement work was premiered by the composer with future BSO Music Director Karl Muck and the Berlin Philharmonic at the Beethoven-Saal in Berlin on November 10, 1904. The concerto ends with a choral finale, whose text is a hymn to Allah from Adam Oehlenschläger’s poem-drama Aladdin. Ten years prior to the composition of the concerto, from 1891 to 1894, Busoni was based in the U.S., having initially traveled there to teach at the New England Conservatory of Music. He was drawn to Boston in part due to the presence of his friend and collaborator Arthur Nikisch, who was then Music Director of the BSO. Busoni’s relationship with the BSO was the first he formed with an orchestra in the U.S., and this professional connection served as a springboard for many years of critically acclaimed performances around the country. Through these performances, which included four concert tours, he established a strong reputation in America. Mr. Gerstein shares a connection to the city of Boston, having moved there from his native Russia at the age of 14 and studied jazz piano at the Berklee College of Music as the institution’s youngest student ever. With the help of the BSO’s longtime principal oboist Ralph Gomberg, Mr. Gerstein also attended Boston University’s Tanglewood Institute, which introduced him to the world of the BSO. He would later become the Tanglewood Music Festival’s 2018 Koussevitzky Artist. This March, Mr. Gerstein returns to Boston to give the world premiere of Thomas Adès’s Concerto for Piano and Orchestra, written especially for him and conducted by the composer. To be first performed at Symphony Hall and subsequently given its New York premiere at Carnegie Hall, the work was conceived in 2012 during BSO rehearsals of Mr. Adès’s In Seven Days, which featured Mr. Gerstein as piano soloist and the composer as conductor. Mr. Gerstein’s most recent album is The Gershwin Moment (February 2018; Myrios Classics), which includes the composer’s Piano Concerto in F, the original jazz-band version of Rhapsody in Blue,and rare Gershwin transcriptions, among other works. He performs on the recording with the St. Louis Symphony Orchestra conducted by David Robertson, as well as with vibraphonist Gary Burton and vocalist Storm Large. Kirill Gerstein is one of today’s most intriguing and versatile musicians, with a masterful technique, discerning intelligence, and a musical curiosity that has led him to explore repertoire spanning centuries and a diverse range of styles. He is the recipient of the 2010 Gilmore Artist Award and received First Prize at the 2001 Arthur Rubinstein Piano Competition in Tel Aviv. A highlight of his 2018–19 U.S. season is the world premiere of Thomas Adès’s piano concerto written for him and performed with the Boston Symphony Orchestra under the composer’s baton. Following this Symphony Hall program, they perform the New York premiere of the work at Carnegie Hall. Mr. Gerstein and Mr. Adès also perform as a piano duo at the New England Conservatory and Zankel Hall. Additional engagements include the Czech Philharmonic’s U.S. tour, in which he performs Tchaikovsky’s final 1879 version of Piano Concerto No. 1, which he has championed in concert and on record, as well as performances with the Cleveland and Philadelphia Orchestras and Atlanta, Cincinnati, Detroit, St. Louis, and Toronto Symphonies, among others. His recordings on Myrios Classics include The Gershwin Moment, Liszt’s Transcendental Études, Tchaikovsky’s Piano Concerto No. 1 (final 1879 version), Imaginary Pictures, which pairs Mussorgsky’s Pictures at an Exhibition with Schumann’s Carnaval, and an album of works by Schumann, Liszt, and Knussen. Born in Voronezh, Russia, Mr. Gerstein was brought up studying both classical and jazz piano. He was 14 when he moved to the U.S. as the youngest student to attend Boston’s Berklee College of Music. As his focus turned back towards the classical repertoire, he furthered his studies with Solomon Mikowsky at the Manhattan School of Music, Dmitri Bashkirov at Madrid’s Queen Sofia College of Music, and Ferenc Rados in Budapest. An American citizen since 2003, Mr. Gerstein now divides his time between the United States and Germany. For more information, visit kirillgerstein.com.